In California, LEED Certification is so in that it’s out. Now that so many of the California Green Building Standard Code requirements essentially bring buildings up to these strict environmental standards, builders and property tenants are shifting their focus from strictly environmental health to employee health and wellbeing. Companies hope this will help attract and retain top talent. Even tech firms like Google, Symantec, Cisco, PayPal and LinkedIn are realizing that, because they’re already at or near LEED level, they don’t necessarily need to pay for LEED recognition. Instead, those and other established companies are choosing to obtain the next level of healthy design, in some cases through what’s called WELL Certification, which sets a standard of best practices for incorporating health and wellness into design and construction. AP+I Design is one of the companies helping them do this. “The focus is coming off of LEED and going more towards really employee-focused benefits that directly affect the employee,” says Carol Sandman, AP+I Design’s principal and founder. That means removing airborne contaminants, providing optimal drinking water, encouraging healthy eating and fitness, minimizing disruptions to the body’s circadian rhythm and creating a distraction-free, soothing environment, all of which are required to obtain WELL Certification, but are also sound principles the firm already practices. At one time LEED certification was a big employee-draw. As attention to employee wellbeing grows, Sandman predicts WELL Certification will be the next talent attractor. AP+I Design was one of the first companies to build to these new standards in the San Francisco Bay Area, and one of its first project under the WELL guidelines was the cyber security giant Symantec. 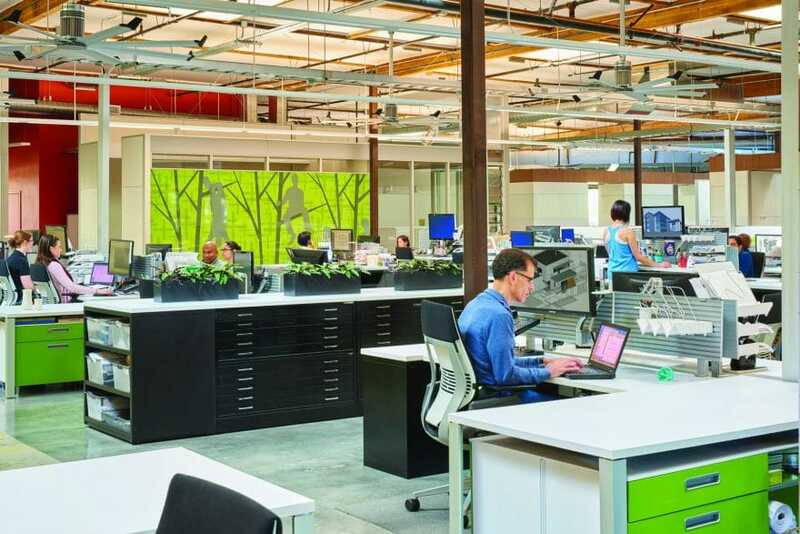 In 2014, the global leader in cyber security Symantec asked AP+I Design and partner architecture firm Little Diversified Architectural Consulting to renovate its 180,000-square-foot workspace in Mountain View, California. 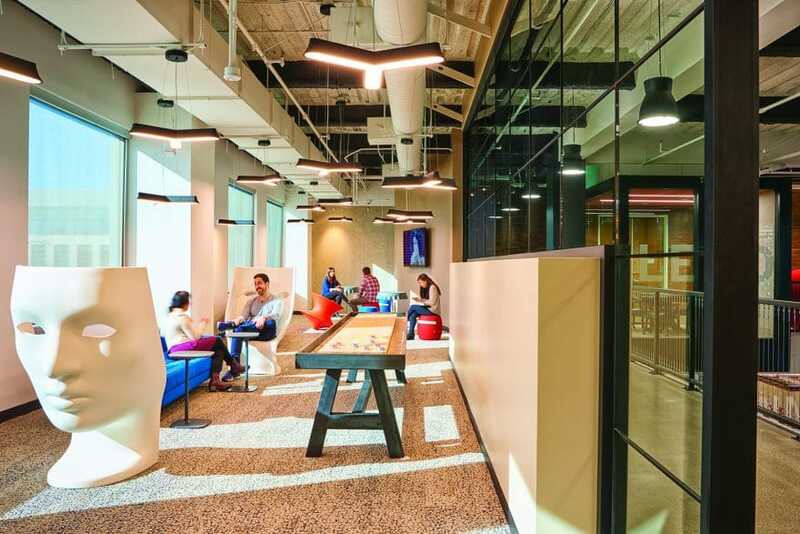 Symantec wanted its headquarters to reflect its brand values and boost employee engagement. It decided to seek WELL Certification as a means of doing that. To support the WELL Building standards, Symantec’s graphic design team added exercise stations with simple equipment like jump ropes hanging on the walls. There is also signage to advertise a quarter-mile loop around the inside of the building to encourage employees to exercise. AP+I Design incorporated WELL’s stringent design criteria into its nature-inspired design concept. Everything from the flooring materials to the reflectiveness of the paint and selection of finishes was taken into consideration and coordinates with WELL criteria in order to foster employee health and happiness through the built environment. To meet WELL’s access to natural light and air circulation requirements and encourage a more open employee atmosphere, AP+I Design also opened up the building’s floor plans. “We tend to do that in a lot of our spaces, and it just so happens that that’s one of the goals that’s part of WELL,” says Shelley Hazlitt, an AP+I Design associate principal. Many of the design elements AP+I Design uses regularly are in line with WELL Building Standards. The company’s longstanding commitment to sustainability has set it up to design buildings that are friendly to both the environment and employees. 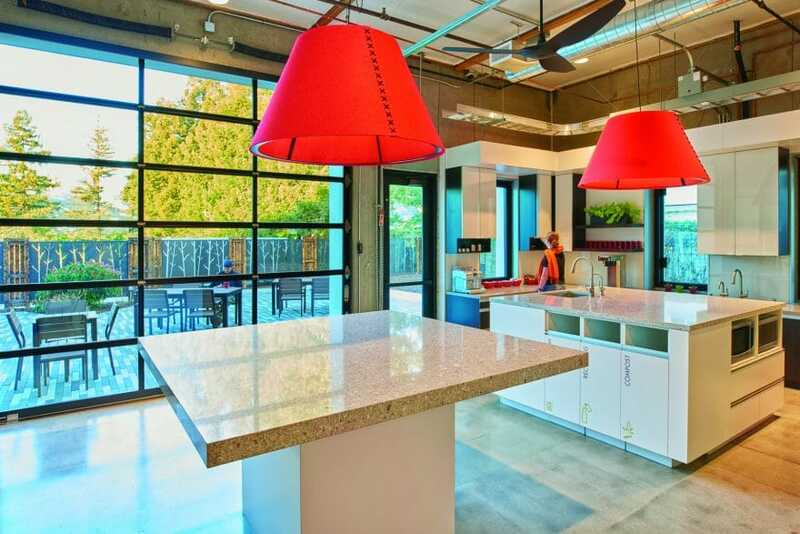 In 2015, AP+I Design moved its office into a building it completely overhauled from a “dreadful concrete building with absolutely no presence” into Mountain View, California’s first Zero Net Energy commercial building, a now beautiful space with plenty of presence. On the exterior there’s a community garden with two large flower beds and two large beds of edibles, like herbs, vegetables and strawberries. There’s a wellness room and an exercise room, and company bicycles and helmets encourage staff to cycle around the neighborhood. The retrofit has large skylights that open and ceiling fans, and about half of its perimeter windows open to create comfortable airflow. An old loading dock is now a patio that employees can access through a large, roll-up glass garage door. That door is often left open, and birds can be heard chirping outside. Guests who visit the building say the air quality is fresh, different from most work spaces. About 90 percent of the interior walls are constructed with DIRTT Environmental Systems products, which offer installation with minimal dust, less material waste and the ability to be easily reconfigured. Everything from concrete cut during renovations to recycled blue jeans used for insulation and reclaimed wine barrel staves were used to keep the building’s eco-footprint minimal. “It was incredibly exciting, but it was also incredibly frustrating doing this for ourselves because we were our own worst clients,” Sandman says. She didn’t want to pull staff from client work, so the project stretched out a bit longer than it should have. Despite that challenge, AP+I Design is proud of the end result, and its employees appreciate their new office. Companies like Symantec and even AP+I Design hope employee-conscious design will make employees think twice before taking jobs with other employers. The lessons AP+I Design learned creating its own Zero Net building will help it complete Zero Net buildings in the future, just as its work with Symantec will help it do more WELL Buildings. For one of its next projects, AP+I Design is helping PayPal rebrand its campus. Like Symantc, PayPal, which split from eBay in 2015, wants its campus to reflect its unique brand values, including its commitment to employee health and wellbeing. Though PayPal isn’t seeking WELL Certification, AP+I Design will incorporate as many LEED and WELL elements as possible.